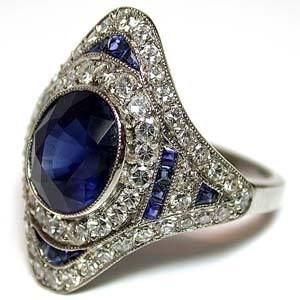 Art deco inspired handmade platinum, sapphire and diamond ring. Centering an oval cut Ceylon sapphire measuring /// mm x /// mm surmounting a platinum frame set with French cut square sapphires and circular cut diamonds from 1925, mounting circa 1990. This ring will come with a $8125.00 appraisal.